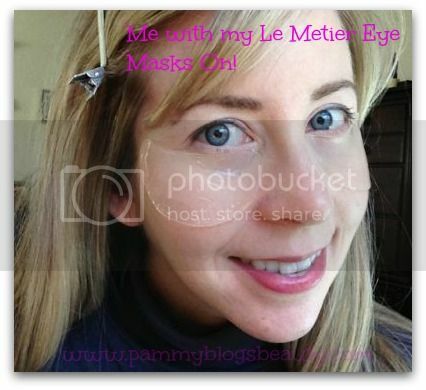 Pammy Blogs Beauty: My Puffy and Tired Eyes get a Treat with Le Metier's Ultra Hydration Eye Mask!!! 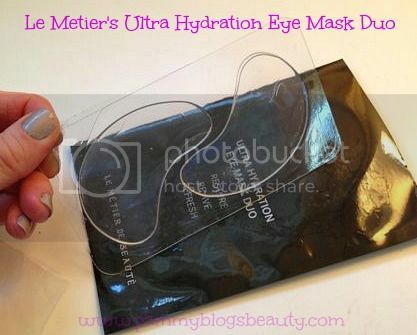 My Puffy and Tired Eyes get a Treat with Le Metier's Ultra Hydration Eye Mask!!! This product testing couldn't have come at a better time! I am home sick this week with a bad cold. To top it off, I am a stay-at-home Mommy of a 13-month old. This is my first time sick with a cold since having a child. I never realized this simple fact: Sick Mommies get no extra rest, lol! Needless to say, my bad cold, my lack of restful sleep, the dehydration from decongestants, and dry skin from the cold weather have my eyes in need of *major help*!!! My eye area literally hurts! Enter the Le Metier de Beaute Ultra Hydration Eye Mask Duo. 15 minutes of rest with these bad boys on and my eye area feels refreshed and I feel like (almost) a new woman! I am in *total love* with this product!!! I don't know about ya'll, but even with as much as I love my beauty pampering, many times I am just too darn tired in the evenings to add one more "step" to my routine. The good news with these eye masks? You literally can use them anywhere and any time. They are so easy!!! The folks at Le Metier have challenged their beauty bloggers to test these eye masks out as part of their daily routine. They encouraged us to get creative. Running errands? Slap on an eye mask! Commuting home from work? Yup, the eye masks can go on in the car! In need of a post-gym refresher? These will do the trick! The idea is to show how quick and easy these eye masks are to use! Well, for me this task was simple. Being sick at home with a cold this week, with no major plans to go anywhere, I simply applied the eye masks at home as soon as my baby girl went down for her afternoon nap (my "me" time). Place one Ultra Hydration Eye Mask under each eye. The mask will adhere to eye area. You can apply these after cleansing or right over your makeup. Since I applied mid-day, I applied right over my existing makeup. Note: These are 1-time use masks. They can be used daily to boost hydration. WOW!!! As soon as I put the eye masks on, my eyes instantly felt soothed. Even though I did not have the masks in the refrigerator, the masks feel cold. They are very moist. Yet, somehow they do not drip product all over your face. The product completely feels concentrated to the eye mask. Honestly, these felt so good on, that I did not want to take them off! I actually left them on for about 20 minutes. The results are amazing! After I removed the mask, I immediately noticed that my under eye skin looked plumped, hydrated, and smoothed! My fine lines literally seemed to disappear. Also, the skin felt a bit "firmed". I am so impressed! My under eye concealer did slide around a bit. However, that was easy to fix! I literally just smoothed it back out with my finger. So, no need to reapply my makeup! If these eye masks can make my eyes look this good when I am tired and worn out from a cold, I can't even imagine what they would do on a "normal" day! So, you really can use these when on-the-go! Especially since they can be applied over makeup with no need to reapply! I think these masks would be ideal for days that you have something special later in the day or an event or date after work. You can freshen yourself up and look younger and more awake simply by applying these masks for 15 minutes! LOL, I wish that I had an unlimited supply of these as I would use them all the time! Seriously!!! I highly recommend these eye masks! What a treat!!! I've seen these eye masks a lot lately...they definitely look soothing. I am totally impressed by these and will be buying them during Neiman's Beauty Event. @lola Seicento-Sorry you are sick with the crud too! Feel better dear!